Sometimes we think people still doing crunches, leg extensions and other nonsense are the rogues. No, no. If you don’t do that stuff, you’re the rogue. But, when you live in a world where everybody has like minds, it’s all the more shocking when you see other people doing things that don’t really fit anymore. With the joint-by-joint approach, Mike Boyle and Gray Cook have a little story on how this came to be, but the basic idea is we’re an alternating series of stable segments moving on mobile joints. A series of stable segments on mobile joints. When you can get that, a lot of stuff will seem very familiar, comfortable and simple. We’re looking at how we have this alternating approach. When something is in yellow, we know that’s a stable joint—we’re going to get to those definitions. Pink is mobile— stable, mobile, stable, mobile. This works in how we understand how the body moves. It’s this alternating series. A lot of this is semantics. This is just how we’re going to use these definitions to understand the principles. Mobility. If mobility means something different to you, that’s fine. This isn’t like stamped in ink. This is just how we’re going to understand the principles. Mobility is what a joint can do on its own with no influence—what it is capable of. What do the hinges on the door do without any influence? No matter how well you know how to open the door and no matter how well you know how to swing the door, the hinges still have to be working properly. If they’re not, it doesn’t matter what you do afterward. Mobility is what I’m describing with those hinges. Are they oiled? Are they in place? What happens at the joints? We’re very interested in mobility in these certain joints here. These are like the hinges of the door. Mobility is what the joint can do without external influence. Stability is how well we can maintain a position in the presence of change. This is the one people really get mixed up. Stability doesn’t mean I can hold a position. For our purposes, if you use the word “stable” to cue somebody to get what you want, by all means use it. 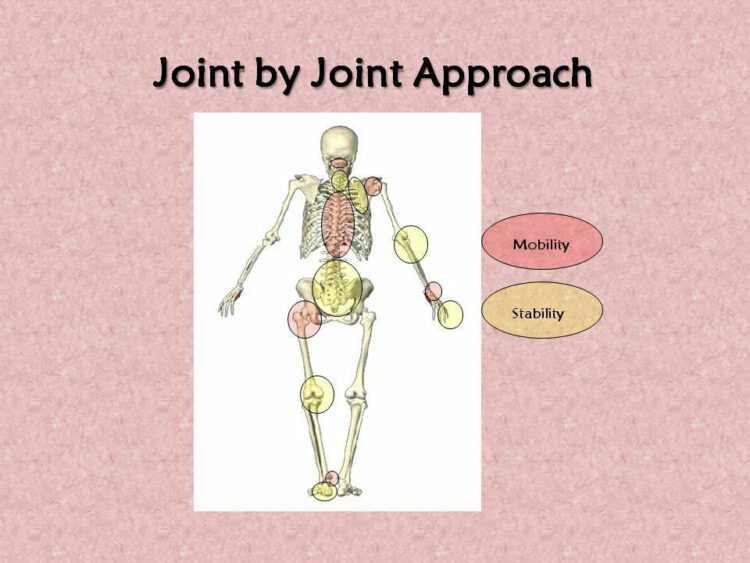 But for the purposes of understanding the joint-by-joint concept, it means the ability for a joint or joint system to control movement in the presence of potential change. Check out more from Training=Rehab, Rehab=Training to learn more about Dr. Weingroff’s continuing efforts to reinvent and redefine the language between rehabilitation and performance enhancement.